"Without the One You Love (Life's Not Worth While)" is a song written by Holland–Dozier–Holland and released as a single in 1964 by the Motown singing group The Four Tops as the second single from their self-titled debut album, Four Tops. The group would later cover the song with The Supremes. (1972) "Without the One You Love"
(1972) "Your Wonderful, Sweet Sweet Love"
(1972) "(It's the Way) Nature Planned It"
"Without the One You Love (Life's Not Worth While)" was the follow up to the Four Tops' prior hit "Baby, I Need Your Loving," and was designed to sound similar, with a similar theme, similar tempo and similar sound. The bass harmony similarly uses a subdominant progression. The opening lyrics essentially repeat the title of the earlier song. Author Sharon Davis claims that the song was "hastily written and released" to capitalize on the success of "Baby, I Need Your Loving." 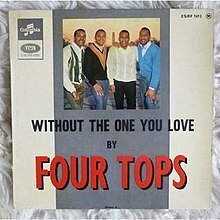 After the near-Top 10 success of the Tops' first hit, "Baby I Need Your Loving", "Without The One You Love" proved to be a commercial disappointment, failing to reach the Billboard Top 40,charting at #43. The song did better on the Cashbox R&B Chart, reaching the Top 20, charting at #17 (Billboard did not show R&B Chart listings during this time). Allmusic critic William Ruhlmann attributes the relative lack of chart success of "Without the One You Love (Life's Not Worth While)" to a number of factors. One is that the title is too long. He also believes that the song is "overproduced," particularly by giving the many backup singers too prominent a role, including singing the opening lines, at the expense of lead singer Levi Stubbs. Nonetheless, fellow Allmusic critic Ron Wynn considers the song to be "marvelously sung." Author Bill Dahl describes the song as "moving." Charlie Gillett claims that the song produces an effect of "irresistible excitement." A cover version of the original Four Tops song was done for The Magnificent 7 album by The Supremes and Four Tops in September 1970. Lead vocals were provided by the groups lead singers, Jean Terrell and Levi Stubbs. Nickolas Ashford & Valerie Simpson and Frank Wilson produced the H-D-H written song, and its album. A single was released in the UK by Tamla Motown in May 1972, titled "Without the One You Love" b/w "Let's Make Love Now". ^ a b c d Ruhlmann, W. "Without the One You Love (Life's Not Worth While)". Allmusic. Retrieved 2014-09-12. ^ Waters, K. (2011). The Studio Recordings of the Miles Davis Quintet, 1965–68. Oxford University Press. pp. 96–97. ISBN 9780199830169. ^ Davis, S. (2012). Every Chart Topper Tells a Story: The Sixties. Random House. ISBN 9781780574165. ^ Wynn. R. "The Four Tops". Allmusic. Retrieved 2014-09-12. ^ Dahl, B. (2011). Motown: The Golden Years: More than 100 rare photographs. Krause. p. 48. ISBN 9781440227837. ^ Gillett, C. (1996). The Sound of the City: The Rise of Rock and Roll. Da Capo. p. 215. ISBN 9780306806834. ^ Whitburn, Joel (2007). Top Pop Singles: 1955–2006. Record Research. ^ Whitburn, Joel (2004). Top R&B/Hip-Hop Singles: 1942–2004. Record Research. p. 212.